Williamsburg, Manhattan? Yup. The tough-to-Google generic name, "Williamsburg Pizza," just got tougher by opening up an outpost in Manhattan's Lower East Side. But, just like the original, their pizza puts them on the map wherever they are. 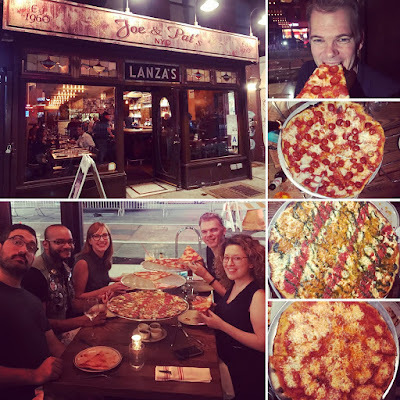 Also taking after the Brooklyn locale, Williamsburg Pizza LES focuses on ingredients and technique over space and access to public facilities. These resources were better utilized in training talented pizza makers to make top tier New York style pizza with high quality toppings. The pecorino-parmigiano and creamy homemade fresh mozzarella cheese blend with the zesty garlic, imported olive oil, crushed tomato sauce and freshly chopped basil. All of these are available in the signature twice-baked gas oven powered Grandma pie. This Sicilian style square is paradoxically light yet sturdy, firm yet chewy, and thin yet filling. Williamsburg Pizza LES has successfully replicated the marvel of nature created at the original. Although these pies travel well, take a hint from the word "Fresh!" printed on every box and order a fresh pie. 1. Glenn Mobley recently visited Norway for a reunion of former Disney employees. Patrick also used to work for Disney. 2. Sean Manning has a Florida connection too. He went to college in Tampa. He also likes dressing in a suit at work. 3. Glenn Mobley, Sean Manning and I are on the same softball team called the Turkey's Nest. We play on Sundays during the summer in Williamsburg, Brooklyn.